An India where creativity and innovation are stimulated by Intellectual Property for the benefit of all; an India where intellectual property promotes advancement in science and technology, arts and culture, traditional knowledge and biodiversity resources; an India where knowledge is the main driver of development, and knowledge owned is transformed into knowledge shared. 7 core objectives, with a number of actionable steps to be implemented by nodal Departments, in coordination with other departments, State Governments, industry and various stakeholders.Department of Industrial Policy and Promotion (DIPP) responsible for overall coordination. To create public awareness about the economic, social and cultural benefits of IPRs among all sections of society. Through roadshows and campaigns; incorporation in syllabi and course material for school and higher education level. Online and distance learning programs to be introduced. Schools, colleges, skill development centers and industry clusters among others to be covered. To stimulate the generation of IPRs. Creativity and innovation would be encouraged, leading to generation of IPs and their coverage through IPRs. 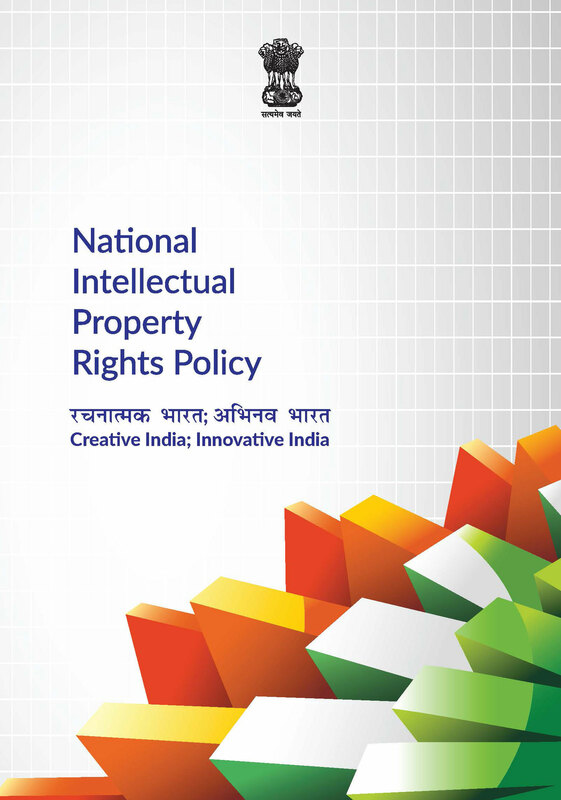 IPR output from Government as well as private laboratories and organizations to be improved; R&D to be encouraged. To have strong and effective IPR laws, which balance the interests of rights owners with larger public interest. Review, update and improve existing IP laws in consultation with stakeholders. Engage constructively in the negotiation of international treaties and agreements. Traditional Knowledge Digital Library (TKDL) to prevent misappropriation of Indian traditional knowledge – increase ambit, examine usage for further R&D. To modernize and strengthen service-oriented IPR administration. Augment manpower after analyzing projected workload, speedy disposal of backlog, requirements of global protection systems and productivity parameters. Restructure, upgrade and modernize IP Offices. Get value for IPRs through commercialization. Marketing of Indian IPR-based products, especially GIs, and services to a global audience. Assistance to smaller firms for protection of IPs internationally. Access to affordable medicines and healthcare solutions. Timely approval for manufacturing and marketing of drugs, while maintaining safety and efficacy standards. Promoting R&D across sectors in public and private institutions. To strengthen the enforcement and adjudicatory mechanisms for combating IPR infringements. Creating IP modules for judges and persons from legal profession. Specialised Commercial Courts to deal with IP disputes. Piracy and Counterfeiting being a serious concern needs to be addressed. Alternate Dispute Resolution methods for Resolution of IP disputes; Mediation and conciliation centres to be strengthened. To strengthen and expand human resources, institutions and capacities for teaching, training, research and skill building in IPRs. Encourage and support capacity building among Women Creators, Innovators, Entrepreneurs, Practitioners, Teachers and Trainers. Encourage formulation of institutional IP Policy/ Strategy in Government Departments, Higher Education, Research and Technical Institutions. IP Cells be set up in relevant Ministries, State Governments, Industry associations and major academic institutions; CIPAM to monitor and coordinate.